Dubai: The two men who went to display diamonds at the Burj Al Arab never suspected their deal would turn bloody. Rami Andrwas Sama'an, a 32-year-old Syrian, was killed last Tuesday at the seven-star hotel when he accompanied his friend and compatriot Elias Al Nadaf, 30, to meet a group of people who claimed to be diamond traders. Sama'an came to the UAE 10 years ago and was a partner at the Al Rozana coffee shop in Al Ghusais. Sama'an has a brother and a sister. His family lives in Ma'areen, a village near Damascus. "He came to work here to support his family and to build a life for himself," said Fadi Al Nadaf, Elias's brother and Sama'an's friend. Al Nadaf said Sama'an was unmarried and was staying with friends in an apartment in Al Nahda in Sharjah. "He was hard-working and never hurt anyone, but he was killed brutally," he said. He was planning to travel to Syria, but had postponed his visit, he added. Police have arrested a group of people who killed Sama'an and injured Elias after a fight. Al Nadaf said Elias traded in diamonds and jewellery, and three months ago met traders from Russia, Azerbaijan and Kazakhstan through an Uzbekistani woman at the gold souq in Dubai. "The five men asked my brother for a specific kind of diamond. He showed them some, but they said they were looking for bigger ones. "My brother asked Sama'an to accompany him to the hotel on Tuesday to meet some Russian diamond traders. They both went at around noon. Because the meeting was at the Burj Al Arab they were not suspicious about the traders," he said. 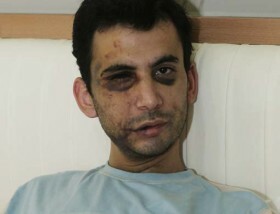 Elias was beaten up by the men, but he pretended to be dead and escaped with his life. He was admitted to hospital suffering severe injuries to his face, head and other parts of his body. He told Gulf News when they went to meet the men, they were not suspicious. "At around 1pm while I was discussing the price of the diamond I had taken with me to the hotel I saw one of the men standing behind my friend who was sitting and just looking at the beautiful room. There were five men, one from Kazakhstan, one from Azerbaijan and three from Russia. "I heard a voice and suddenly the men pushed Sama'an on the sofa and started beating him. They hit me on my head and I fainted. They thought that I was dead. My friend resisted them. They beat him brutally and they beat me. They tied his legs, hands and put newspapers inside his mouth. "When they started beating us they raised the volume of the TV so no one would hear the noise. They fled with diamonds but I was able to call for help. Sama'an died because they hit him brutally. He suffocated to death." Al Nadaf said Sama'an's family came to know about his death through one of their relatives living in the UAE. "Anguish and grief dominate their lives. They are waiting to receive his body to be buried in their hometown," he said. 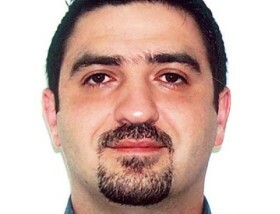 Adnan Huwak, a Syrian and a friend of both Al Nadaf and Sama'an said friends were shocked. 録画していた藤原竜也版を見ました。感想としては、うーん、詰め込み過ぎ？というか短すぎ？ 前にみた竹野内豊バージョンがえらい良かったせいもあり、期待していたんだけど、まぁ残念ながら竹野内豊バージョンの方が細やか。 謎解きとか心情の変化とかも、連ドラのじっくりかけてやっていたのに、さすが２時間ドラマ、2秒で謎解き終了〜 折角緒形直人とか久々に出てたのにもったいない。 消化不良なんでGWに竹野内豊バージョン借りて見ようかなぁ。 No tags for this post. ラッファ-君 きたーーーーーーー！！ ついに、ついにあたしの愛しのテニスの王子様、ラファエロナダルがナンバルワーン！！ うれしいいーーーーー。あたしもテニス、がんばるぞ！ No tags for this post.